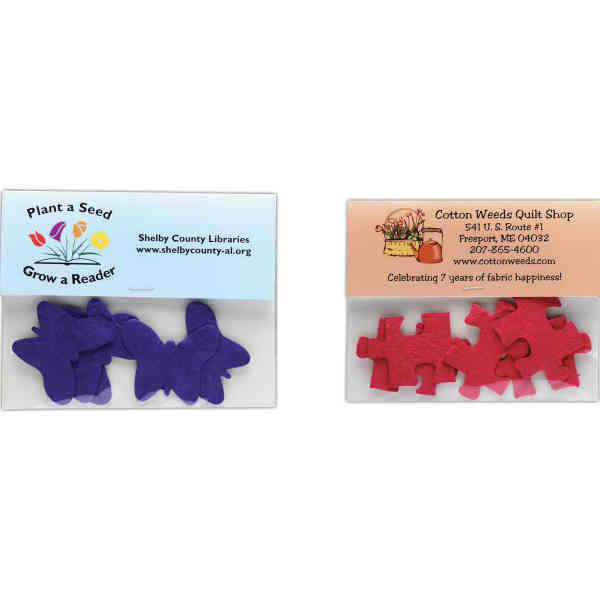 Raise your brand's tech profile with the promotional look of this Plant-A-Shape Confetti Packet. Choose from any of our seed paper shapes and customize your packet with the right look for your event! The shapes measure approximately 1/2" x 1 1/2" and you get 5-7 seeds in each packet. They're available in 14 different colors and there's sure to be a shape to grow your brand or message. Don't see a shape you need? Use your imagination and let us help! It features your full color message on the front and back as well as planting instructions on the back. Size: 5 1/2 " x 4 1/2 "